The UFC announced a boatload of fights on Friday at the special UFC 25th anniversary press conference from inside The Orpheum Theatre in Los Angeles, California. The news of an anticipated lightweight showdown between Nate Diaz and Dustin Poirier to take place at UFC 230 on November 3 revealed on late Thursday night. UFC officials confirmed the bout for the pay-per-view event at today’s Press Conference. Poirier discussed the bout at the beginning of the presser, but Stockton native was noticeably absent. 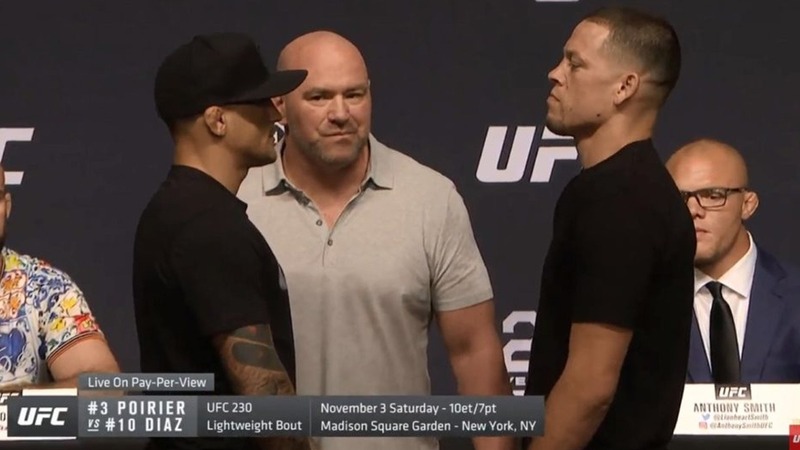 Diaz then came in late to face off Dustin Poirier to the leading up to their fight at UFC 230 in New York City.